Dental Implants: What is an implant? Twenty-five years ago, if someone described how missing teeth could be replaced with implants, it might have been called a miracle. Ten years ago, the use of dental implants to replace missing teeth might have been called astounding. Today, implant procedures are called routine. A dental implant is a titanium root substitute that is placed or implanted in the jaw bone to replace your natural tooth root. Bone integrity is preserved for long-lasting esthetics. It can be used to replace a single missing tooth, provide an anchor, replace several missing teeth, or provide added retention to a removable dental appliance such as a full or partial denture. In fact, if you are missing all of your natural teeth, it is possible to have upper and lower fixed replacements. The replacements do not come out and you cannot remove them yourself. Two separate events are needed when replacing a missing tooth with an implant. The replacement teeth are constructed and fixed into proper position. The implant placement procedure involves making a small incision in the gum area where the implant is to placed, preparing a site in the underlying bone, inserting the implant into the prepared site, and closing the tissue over the implant with several sutures. This area is left undisturbed, usually for 4 to 6 months. More healing time may vary due to the density of your bone. The lower jaw Picture 13 is composed of bone that is more dense than that of the upper jaw. This healing time allows for the slow integration of the implant within your jaw. The implant is held in place by the bone. After the healing and integration of the implant, the placement site is exposed by reopening the gum. 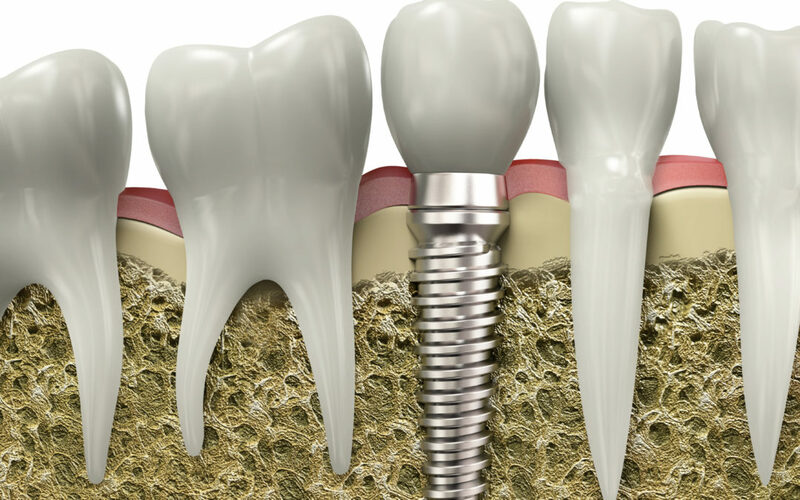 A post will then be fastened to the implant by cement or with internal threads. The crown, bridge, or other type of replacement will be attached to this post. Some dentists prefer to do all phases of the implant procedure themselves, but many choose to perform either the surgical or prosthetic (the actual construction of the replacement device) only. If this is the case, you will be referred to a periodontist or oral surgeon who will perform the surgical portion of the implant placement. Implants are very successful with a success rate of more than 90%. Lower implants have a somewhat higher success rate than upper implants. Occasionally, implants fail, but it is not common. Chances of an implant failure, many times, can be determined during or after the surgical phase before the replacement tooth or teeth are constructed. Smokers take note: There is a heightened risk of dental implant failure among smokers-as much as a 20% greater failure rate! We will discuss with you the requirements and options for your particular situation. There are usually several possibilities for effectively replacing missing teeth. It is important to decide on the design of the implant-retained replacement prior to the actual implant surgical procedure. Position, the number of implants to be placed and the alignment of the replacement teeth need to be carefully considered before determining the location of the implant. Placing enough implants to restore teeth is vitally important to the long-term success of the restoration. Simply stated, the most costly mistake is to have an implant fail because not enough implants are placed to support the teeth. If the number of implants is limited due to financial constraints of the patient, then the implant treatment should be avoided or the type of restoration must be altered. Dental implants combine the best of modern science and technology, including a team approach: you, our doctors, and our specialists (who will be placing the implants). Like a well trained orchestra, each member is important and dependent on the other for the overall success. We are happy to be a part of your team. The implant does get anchored to bone. This means that your bone has to be able to hold on to the dental implant. With diseases like periodontal, the bone is weakened, and even forced to recede. If you have periodontal, and had it for a length of time, then you likely cannot get an implant. Ask your dentist about it. Hello, great post and lovely photos as well. I strongly recommend dental implants to replace missing teeth. They provide the best long term replacement option.